Lords Mobile Event: Come Spin the Slots of Fortune! Do you want to win a rare "Royal Wonder" figure? 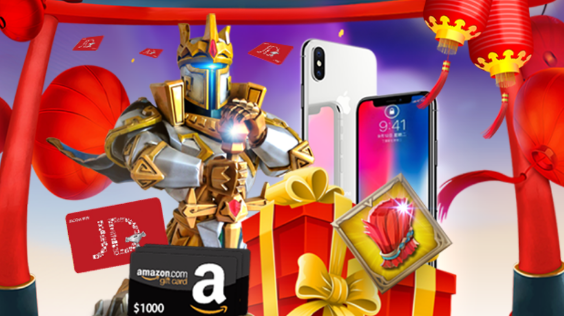 Now Join in the Fortune Spins events, and you could win this limited edition figure, an iPhone X, gift cards worth up to $1000USD, or 5 Legendary Crimson Manes! The biggest festival of Spring is almost here! Everything is decked out in a glorious crimson, along with wishes of luck and fortune for all! Could this be your year? Step right up and see if the gods of fortune will smile upon you! You could win online Gift Cards (up on $1000 USD), or 5 Legendary Crimson Manes! And if you're really lucky, you could walk away with an iPhone X! Lords Mobile will also be giving away a limited edition "Royal Wonder" figure to the top player of this event! Who will win this special treasure? Click on the game page for more details. IGG and the Lords Mobile team reserve all rights to the final interpretation of this event, its entries, rules, and rewards. Previous Previous post: Lords Mobile Festival of Love Event Preview: Feel the Love! Sweet Heart!